Twitter is currently one of the most popular social media platforms available to consumers and businesses alike. With that being said, are you doing everything you can to generate new leads for your business via Twitter? The days of simply posting content to Twitter and assuming that your followers are going to share it with their friends are over. According to Gallup, 62% of Americans say that social media has no influence at all on their buying habits, further proving that the old techniques of sharing content and having people like it are not working. So, if that’s the case, what can we do to better utilize Twitter to generate more leads? With so few Americans saying that social media actually influences their buying decisions we need to get creative in the ways that we track down new leads for our businesses. The truth is, people who choose to use Twitter are often communicating their thoughts and feelings in real time, and often times these communications are in regards to satisfaction or dissatisfaction regarding a product or service they recently bought. Because we know people are communicating their thoughts in real time, we are given an opportunity to take advantage of their needs and communicate with them directly and quickly in hopes to win their business. For example, let’s say you owned a roofing company and were looking to pick up some extra work for the upcoming month. Would simply posting a tweet saying, “We’re offering 5% off complete roof repair in the month of September!” generate you a ton of leads? All of these types of people are potential customers. If they need a new roof, you can contact them directly and hopefully get them on the phone. If they just need a repair, it’s another great opportunity to get in touch with them. If they are unsatisfied with the work a competitor performed, this is a great time to speak with them as they are much more inclined to do business with you if you can prove that your quality of service is better. So, now that you’re all pumped up about finding new customers in a new, creative way, how are you going to do it? Sure, you could search twitter for phrases related to new roofs or mentions of competitors, but this can be time consuming and may miss a lot of opportunities. Fortunately, Twitter already has a power tool built into their API called Tweet Deck. This package integrates directly into your Twitter experience and allows you to customize timelines, lists and searches as well as allowing you to manage multiple accounts at once. Finding new customers with Tweet Deck is actually easier than you may think. To get started, navigate to the TweetDeck home page and click the red “Sign in on the web” button to get going. A new page will ask you to login with your existing Twitter account, and then you will be taken to a page that should resemble the one below. Upon first inspection there a few things to notice. On the left toolbar, you will notice (starting from the top) options for search, home, notifications, messages, your account activity and a “+” that allows you to add more columns. Towards the bottom of the toolbar you will also see icons for lists, collections and settings for your account. The first thing we’re going to look at is how to track some of your competitors mentions on Twitter and hopefully find some unsatisfied customers that we can reach out to. For this example, we’re just going to track Tech Function and demonstrate what we should be looking for. To get started, click the “+” sign to add a column and click the “@ Mentions” option once it appears. You should now be able to add a competitors Twitter handle, like I have done below for Tech Function. As you can see, Tech Function doesn’t have any negative mentions per se, but if your competitor had any mentions from people they have done work with you could either directly message that individual via Twitter or run a query on Google to find their email address, or preferably, their phone number. After you have their contact information it becomes easy to ring them up and try to win their business away from your competitor. With all of this being said about competitors, don’t forget to check for mentions of your own name as well. The last thing you want to see is one of your clients tweeting frustrating messages about a service you performed, but this also provides an opportunity for you to reach out to them and correct the problem at hand, making it much more likely they will amend the poor remark and recommend your services in the future. Another great way to reach out to new customers is monitoring the mentions of keywords that are relevant to your industry. Going back to the roofing example, using relevant industry keywords such as #roofing allow us to find customers that are talking about your specific niche. As shown below, an individual is not satisfied with the new roof they had installed for them. This is a great way to reach out, make contact and demonstrate that your quality of service is much greater than your competitor’s. If you work in an industry that is influenced by big names, such as Warren Buffet in the investing world or Chris Coyier in the web design field, keeping up to date with them on Twitter can be an easy way to grab new customers. Often times people will look to these people as sources of information, and by following their conversations you can also reach out to those in need and hopefully score some business off of them. Additionally, by following the key players in your industry you might even come across some new techniques or information that may be worth looking into. 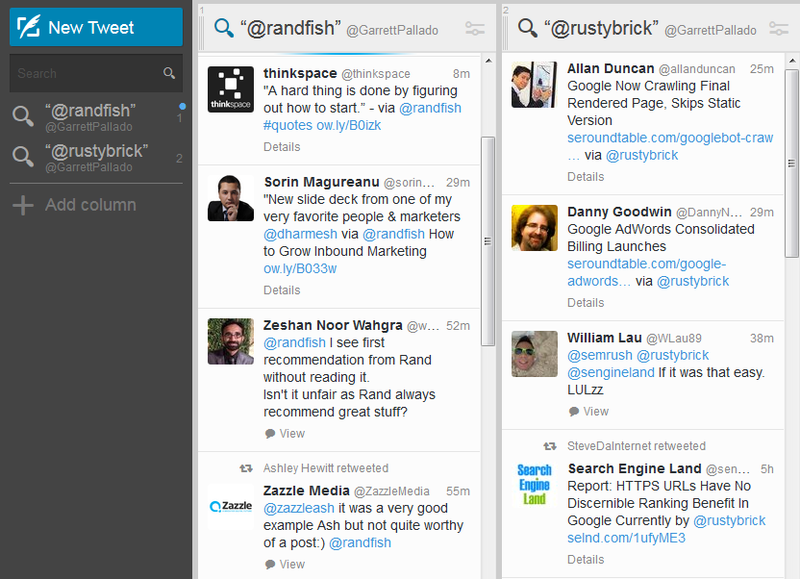 For example, I’ve added two columns to my TweetDeck above that feature Rand Fishkin, founder of Moz, and Barry Schwartz who runs Search Engine Roundtable. Because I follow the mentions of these two prominent individuals in my industry, I often find new and exciting discussions that they are involved in, and it often leads me to finding new techniques and strategies that I can use in my own campaigns.